Welcome to my new blog! As you have probably already guessed from the title, the main focus of this blog will be our adventures in homeschooling and raising our beautiful children. I hope to also include some reviews of homeschooling materials and online resources. The program I'd like to talk about today is not directly related to homeschooling but it does have to do with FREE BOOKS! Random House has a program called Read It Forward which is designed to distribute advanced reading copies of forthcoming books to really anyone who is interested (no, you don't have to be a teacher or a reviewer or anything, just someone interested in books). If you sign up for the program, you will receive books as they become available. To sign up, go to www.ReadItForward.com. I signed up for the program a few weeks ago, but I was still surprised when UPS pulled up at my door yesterday and delivered my first advance copy. I'm actually excited about the book. It's not something I would have picked up at a bookstore, but the subject interests me very much. 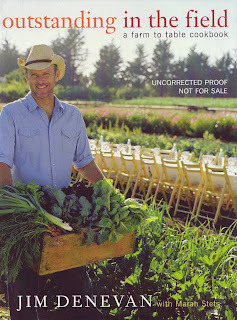 It's by Jim Denevan and is called Outstanding in the Field: a Farm to Table Cookbook. What intrigues me is not so much the cookbook part of the book, but the introduction where he talks about the need to reconnect us all with our food and the origins or our food: where does it come from, who grows it/raises it, how do they grow/raise it? Mr. Denevan is a chef in California who became disillusioned with restaurant food and a chef culture that glorifies the skills and talents of chefs and disregards the whole story of our food. As a reaction to this, his restaurant first started having "Farmer Dinners," where they would invite farmers to come in and talk to the restaurant patrons about themselves and the food they produce. These were enthuasiastically received, but it still wasn't enough. Since September 1999, he has been hosting "Outstanding Dinners" on various farm sites across the country. The idea is to take people to the place where the food comes from, walk through the fields, have a master chef cook the food on site and eat under the stars (or in a barn if the weather requires it). Perhaps this sounds like a whole bunch of new-age silliness, but, I think his original point is sound, we are strangely disconnected from our food, even here in the middle of farm country. Of course, much of our corn is being grown for ethanol instead of food, but that's another issue entirely. Our family does grow some of our own food and I have to admit that our children do have an appreciation for vegetables because of it. The neighborhood kids eat our cherry tomatoes and pea pods right off the vine as if they were candy. We try to buy as much as we can directly from farmers instead of the supermarket and our children have even developed a loyalty to certain farmers ("You know mom, Mrs. Callow really does have the best sweet corn.") This is a person they have met, a real person with a face and a smile. Going back to the book, since this is an advance copy, it doesn't have the glossy full-color pictures you would normally expect in a cookbook. You might expect from the title that these are simple, down-home recipes...think again! I don't think, for instance, I will be trying the "Red Wine-Braised Octopus with Escarole and Chickpeas." Come on, I live in land-locked MO! Or "Duck Breast with Pomegranate Sauce." But the "Lemon Cucumbers with Oregano, Feta, and Pine Nuts" sounds interesting (though I would probably sub walnuts since pine nuts are a little spendy for me). I'll post an update when/if I get around to trying any of these recipes. I am so happy that you have started a blog! I love the photo of the kids. Can't wait to read more posts.